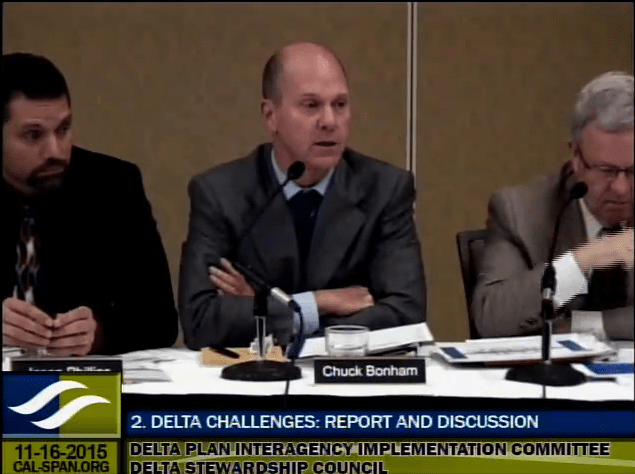 As implementation of the first Delta Plan enters its third year, the Delta Plan Interagency Implementation Committee held the second of two semi-annual meetings on November 16 in Sacramento. The Delta Plan Interagency Implementation Committee (DPIIC) is comprised of eighteen heads of the state, federal, and local agencies that are responsible for implementation of the Delta Plan, and serves as a forum for these agencies to increase their coordination and integration in support of shared national, statewide, and local goals for the Delta. Among those in attendance is Secretary of Natural Resources John Laird, Chair of the State Water Board Felicia Marcus, Secretary of Agriculture Karen Ross, Director of Department of Water Resources Mark Cowin, Director of the Department of Fish and Wildlife Chuck Bonham, and Department of the Interior’s Lettie Belin. 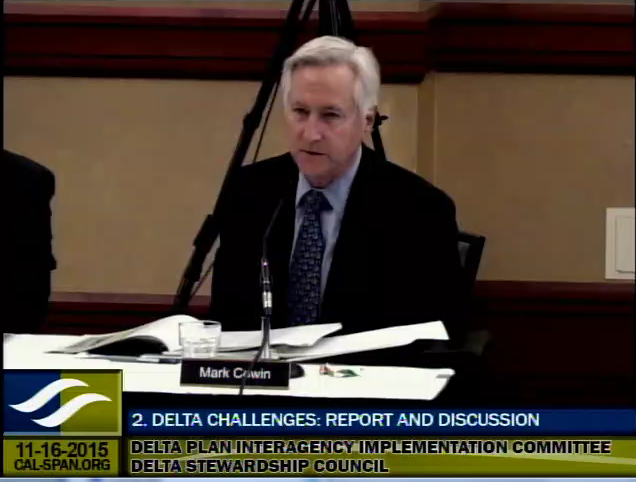 The committee chair is Randy Fiorini, who is also chair of the Delta Stewardship Council. Click here for a list of committee members. 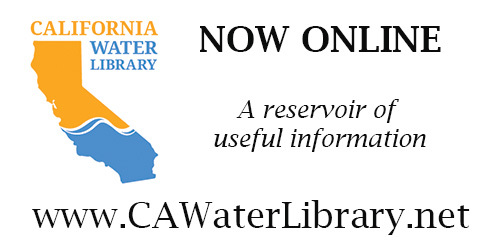 On the agenda for this meeting, a briefing on the Delta Challenges report, an update on the California Eco Restore program and the ongoing efforts in the Yolo Bypass, a report on the implementation of “One Delta, One Science”, and a briefing on the Delta Independent Science Board’s Fish and Flows report. 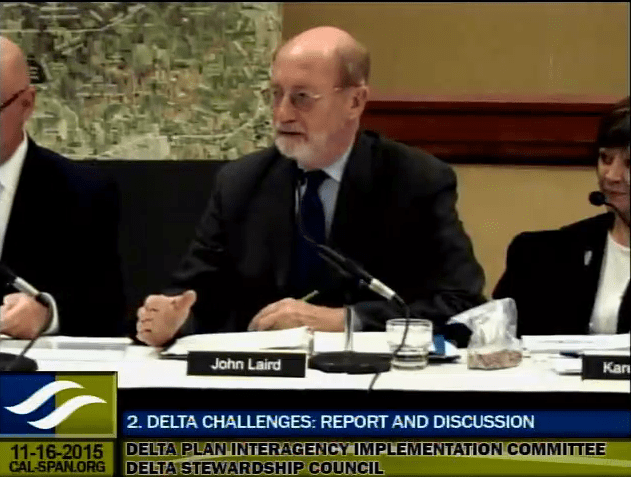 Lead Scientist Dr. Cliff Dahm began the presentations to the committee with a briefing on the Delta Challenges report, which was written by himself and three former Delta lead scientists. 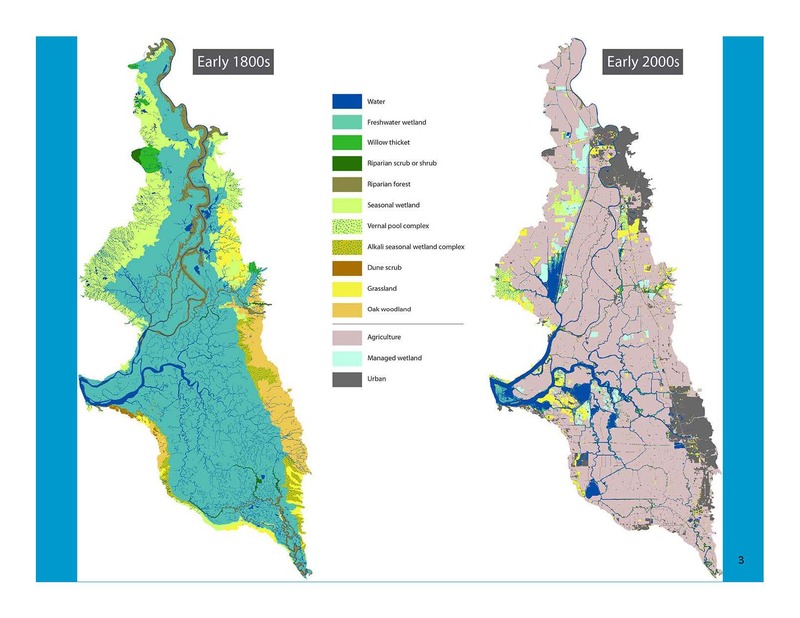 The four scientists were tasked with preparing a concise report to describe the complexities of the Delta that would be understandable to policymakers and the general public. “I do think that the message is notwithstanding the complexity, that status quo is not viable, actions need to be taken, and we need to adaptively manage but not be so afraid to take action as to not take any action,” Ms. Belin added. 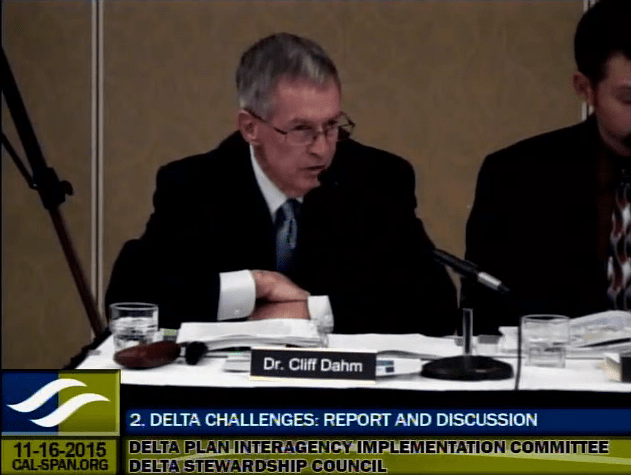 Dr. Cliff Dahm then presented the key points of the report to the committee members, noting that he would do so by answering a series of questions. Dr. Dahm said that they used the concept of a ‘wicked problem’ which is derived from the social sciences and is defined as a ‘problem that is difficult or impossible to solve because of incomplete, contradictory, and changing requirements that are often difficult to recognize.’ He emphasized that the use of the term ‘wicked’ denotes resistance to resolution; it certainly does not mean evil. Other problems that have been described as wicked are problems such as Pandemic outbreaks of flu, proliferation of nuclear weapons, global terrorism, health care, and climate change. 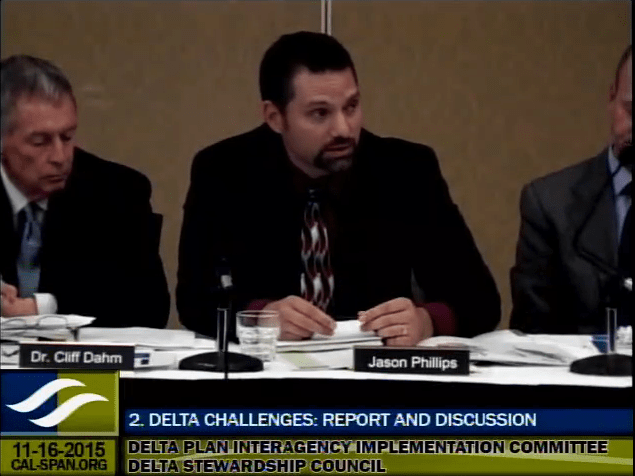 “Those are examples of wicked problems, and we felt that the Delta, too, is a wicked problem,” he said. 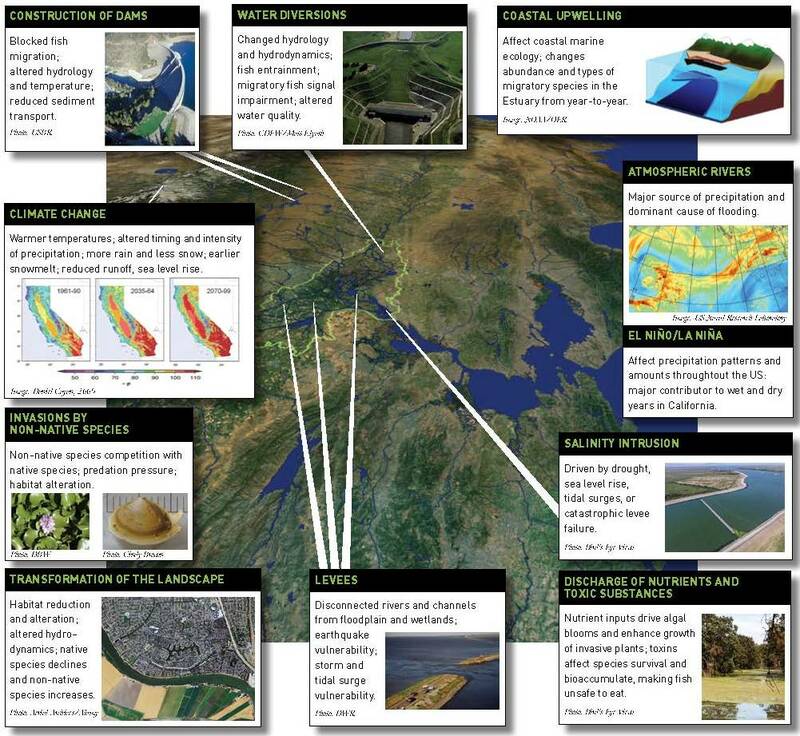 Structural: “Examples include the many dams, the water diversions, the levees, and land use,” he said. Why is the Delta a study in complexity? Dr. Dahm said that Delta complexity comes in many interacting forms: physical system complexity, water supply complexity, water quality complexity, ecological complexity, and institutional complexity. Water quality complexity: Examples include mercury, selenium, biomagnifying organic compounds that get into the food web, emerging toxic compounds like pharmaceuticals, personal care products, pesticides, nutrient loading from agriculture, and wastewater treatment plant inputs. What are key conclusions for coping with complexity within the context of a wicked problem? 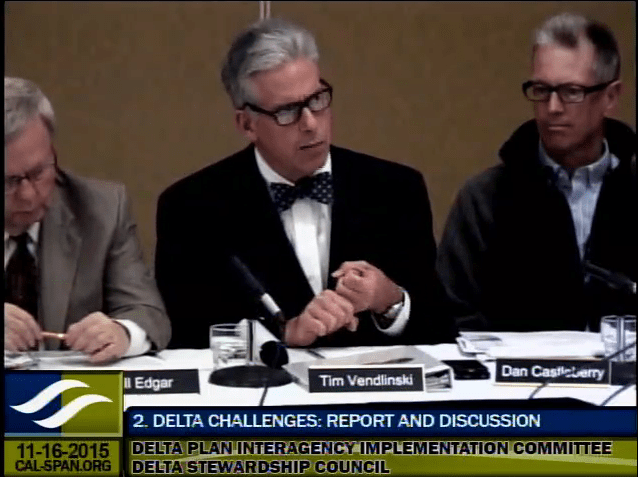 Click on the graphic to download a copy of the Delta Challenges report. 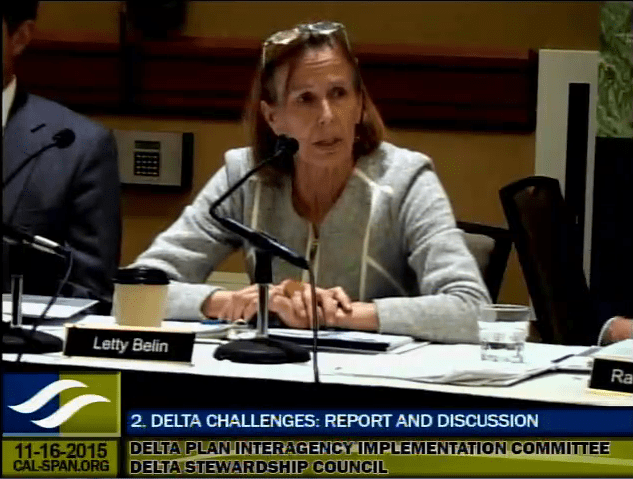 “This meeting of the Delta Plan Interagency Implementation Committee offers an opening and an opportunity for this multi-institutional collaborative processes called out in this quote,” concluded Dr. Dahm. Committee Chair Randy Fiorini then opened up the floor for discussion, asking the committee members to share their agency’s activities and any opportunities. 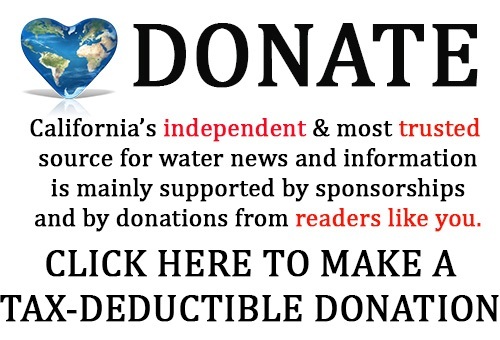 Ms. Marcus said that the update of the Bay Delta Water Quality Control Plan is very important and also complex, and has been delayed because the staff that would be working on it have been pulled off to work on drought efforts. They are currently working on hiring additional staff so they can get the update completed. 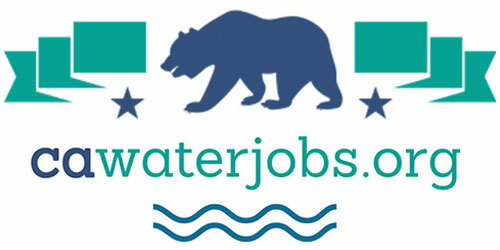 The SED for phase 1, San Joaquin River and southern Delta salinity objectives, should be finished soon. They are currently doing the scientific review document for the phase 2 work; she expressed appreciation for the assistance of the Delta Science Program. “The update is really our top priority other than drought response in the work we do, and we’re committed to doing it,” Ms. Marcus said. 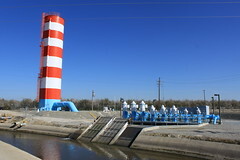 Ms. Marcus said the State Water Board is also working on a number of contaminant issues, including the Sacramento regional wastewater treatment upgrade, the irrigated lands program, and the conundrum of legacy mercury contamination. 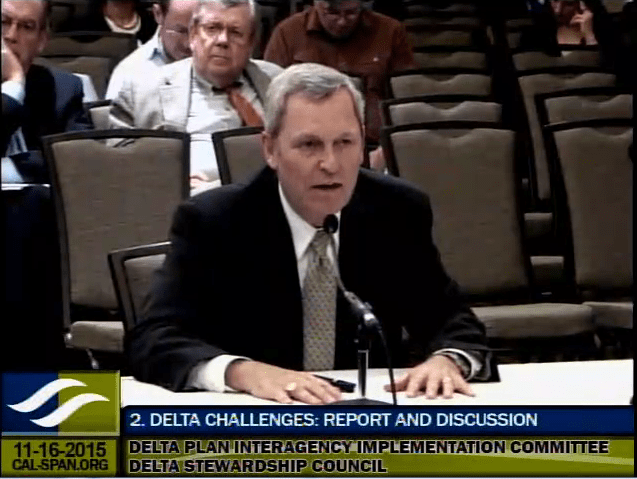 Mr. Cowin said he wouldn’t list all the programs the Department operates that has some effect on the Delta; certainly there is their statewide responsibilities towards improving regional supplies through integrated regional management and water conservation, their flood management activities both upstream and in the Delta itself, the Delta levee subventions and special projects programs, efforts to contribute towards ecosystem restoration, ongoing water project operations, and their efforts to modernize the state and federal water projects through California Water Fix. Tim Vendlinski, Bay Delta Program Director for the EPA, said his agency has been concerned with the subsidence in the Delta, for the infrastructure there as well as the communities in the Delta, citing a multi-agency effort working on opportunities to sequester methylmercury with low intensive chemical dosing while also reversing subsidence. “On the peat islands, the idea is that to do wetlands restoration where the peat soils would start forming again with the growth of the vegetation and combining that with low impact chemical dosing to sequester out the methylmercury, but at the same time, those wetland plants would also be sequestering greenhouse gases,” he said. But as with most efforts, funding is a concern, Mr. Ingram pointed out. 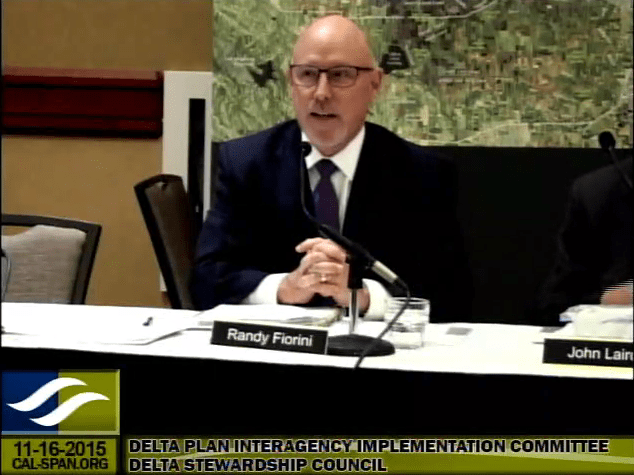 “One of the things that concerns my governing board is that most of the funding for these efforts is coming from Prop 1 Delta Conservancy funding, and certainly they are interested in not seeing the Conservancy shoulder all of that planning cost,” he said. 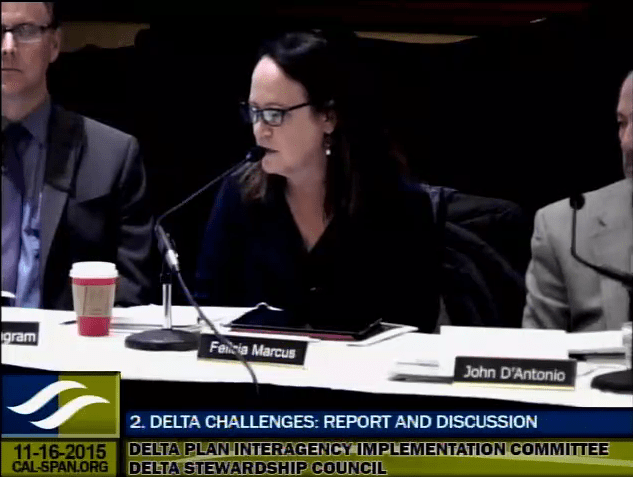 State Water Board Chair Felicia Marcus then invited Delta Watermaster Michael Geroge forward to discuss the work underway to get a better handle on in-Delta water use. 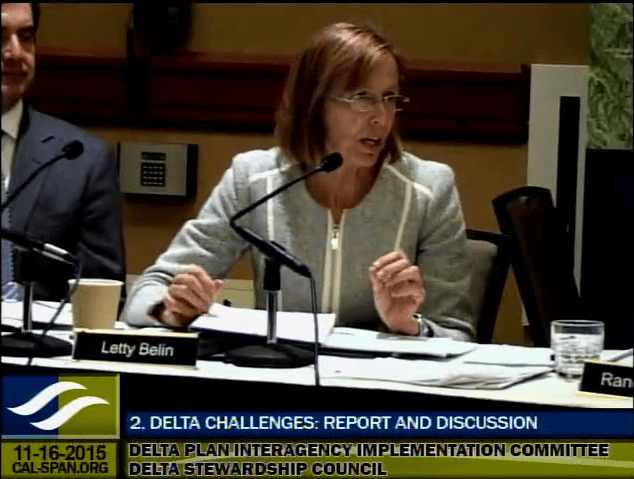 For the meeting agenda and materials for the November 2015 meeting of the Delta Plan Interagency Implementation Committee, click here. This is agenda item #3. 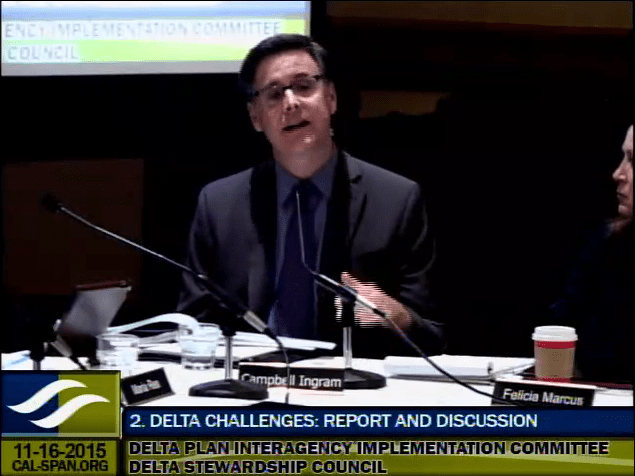 Coverage of the Delta Plan Interagency Implementation Committee continues with an update on the California Eco Restore program and ongoing efforts in the Yolo Bypass.